The Charge 2 scores your heart health and helps you relax with deep breathing, while the Flex 2 goes from the swimming pool to an evening out. Bottom line: Should you upgrade to watchOS 3? 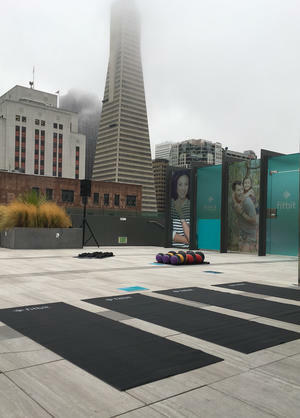 Fitbit let me test its new models—the heart-rate-tracking Charge 2 and the ultra-slim swimproof Flex 2—with an intense interval workout on a scenic San Francisco rooftop last Thursday. And my legs are still sore. What started as a way to count 10,000 steps per day is now a full health and fitness platform, tracking all kinds of exercise, keeping an eye on your heart rate both in motion and at rest, prompting you to keep moving throughout the day, and calming you down with deep breathing exercises. 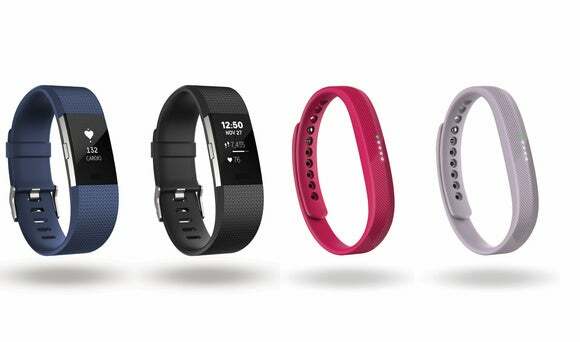 The new devices are both worthy upgrades to the models they’re replacing, and now the Fitbit app supports pairing more than one device, in case you want to use a Charge 2 for most of the day, and switch to the Flex 2 for swimming or a more discreet evening look. The Charge 2 tracks heart rate, just like the original Charge HR, but the Charge 2’s screen is four times bigger, letting you see more data at a glance and get better notifications from your smartphone. It’s not quite as full featured as a smartwatch like the Apple Watch or an Android Wear device, but it checks most of the boxes—the Charge 2 can notify you of incoming calls and texts as well as calendar appointments, when it’s in Bluetooth range of your phone. The app also lets you set alarms (which can be turned on or off on the tracker itself), reorder the menu items, and choose a new clock face. Charge 2 has a bigger screen, but is just as comfortable as the original Charge HR. The Charge 2 has “multisport tracking” so you can use it for to track almost any kind of exercise, like yoga, ellipitcal workouts, and interval training. Some sports like running, walking, and cycling can be detected automatically, meaning you don’t even have to put the Charge 2 into workout mode. 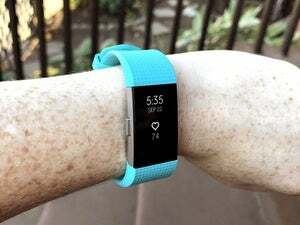 It doesn’t have built-in GPS like Fitbit’s $250 Surge tracker, but the Charge 2 uses “connected GPS” to track your walking and running routes in the Fitbit app with your phone’s GPS, and show pace and distance data on your wrist in real time. The larger screen shows more data while you’re working out, and easier-to-read notifications from your smartphone. The Charge 2 tracks your heart rate all day, and the updated Fitbit app can even give you a Cardio Fitness Score, based on your resting heart rate as well as data gathered during exercise, and compare that score to other users your age. That way, as you progress, you can see how lifestyle changes like moving more and eating healthier affect your overall score. The Charge 2 unit I’ve been playing with over the weekend doesn’t have final software, so a full review will come a little later, but so far I’ve been impressed with how closely the heart rate data matches my Apple Watch. Charge 2 reminds you to move every hour, just like the Apple Watch, but it’s a little more demanding. My Apple Watch wants me to move for one minute of every hour, and will remind me at 50 minutes past the hour if I’ve been stationary up until then. And the Fitbit Charge 2 does the same thing. But while I can just shake my arm around in the air for a bit (30 shakes up and down seems to do it) to satisfy my Apple Watch, the Charge 2 really wants me to walk around, for 2 minutes or about 250 steps. I found it harder to fool—guess I’ll really have to get up once an hour! The new Charge 2 has interchangeable bands. 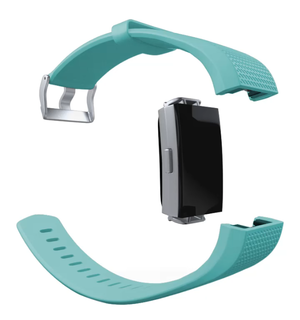 The Charge 2 is comfy, with a secure metal buckle, and the straps are interchangeable. 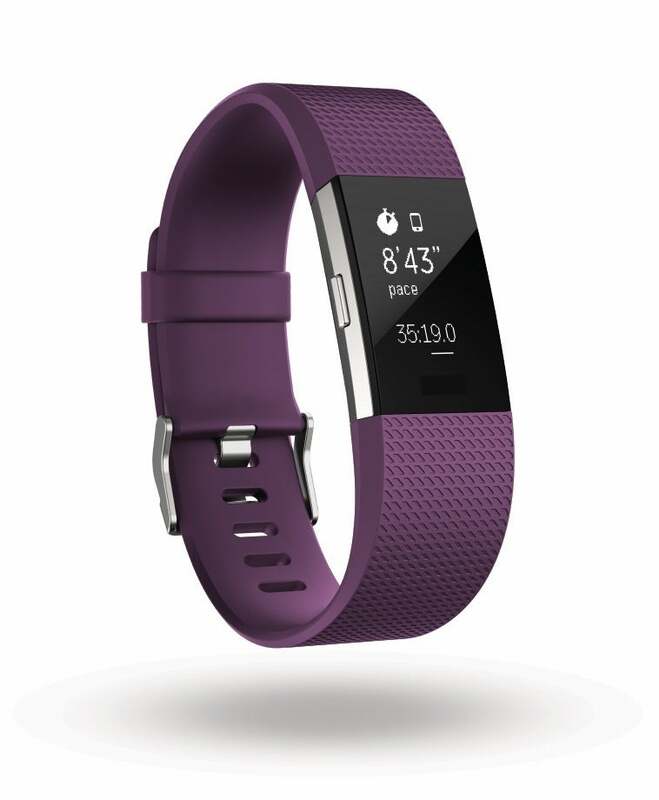 Fitbit is selling the Charge 2 with a rubbery strap for $150, in black, plum, blue, and teal. A special edition Charge 2 comes with a rose gold finish on the tracker and lavendar strap, or an all-black strap with a gunmetal tracker, for $180. And brown, pink, or indigo leather straps cost $70 without the tracker included. We’ll follow up with a full review shortly. The Fitbit Flex deserves its name because while it can be worn in a plain rubber wristband, you can also dress it up. 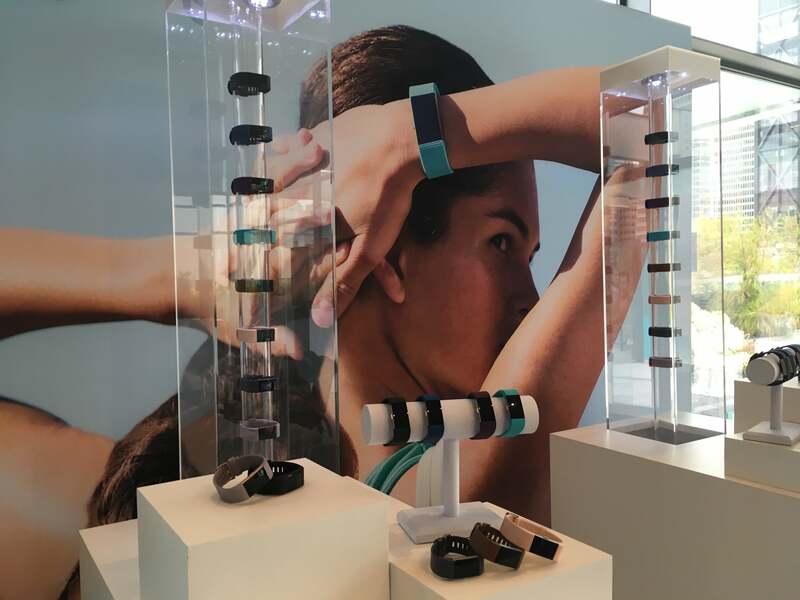 For the Flex 2, which is 30 percent smaller than the original Flex tracker, Fitbit is selling “luxe” bangles and pendants that look like trendy jewelry, but still let you interact with the tracker and its series of notification lights. The Flex 2 comes with several colors of bands, with Luxe pendants and bracelets sold separately. The Flex 2, like the orignal Flex, has no screen. Instead, it has a string of five small LEDs. In the original Flex, the lights were all white, and when you tapped the tracker to see your progress toward 10,000 steps, each light would represent 2,000. If three lights lit up and the fourth one was flashing, you’d know you were somewhere between 6,000 and 8,000 steps on the day so far, and you could always pop open the smartphone app for an exact count. On the Flex 2, you see your step progress the same way, but now the LEDs are colored, which lets the Flex show you some rudimentary notifications too. For example, if you get a text message, you could see one pattern of lights and get a custom vibration, and then use another pattern of lights and vibrations to indicate an incoming call. I got to test the new Fitbits with a workout led by volleyball legend Gabby Reece—this is a view of our foggy torture chamber before the pain started. The Flex 2 is also swim-proof, the first fully waterproof Fitbit. (The Charge 2 is water-resistant, so you can work out in the rain but you probably shouldn’t wear it in the shower, and you definitely shouldn’t take it swimming.) Flex 2 can count laps and strokes if you use it while swimming, and it’s safe for the ocean as well as swimming pools. Fitbit says the Flex 2 will also last five days between charges, but we’ll have to test that more throughly in our full review. Flex 2 keeps the same price as its predecessor, $100 suggested retail price, with straps in black, lavendar, magenta, and navy. Additional straps in blush pink, gray, and yellow are $15 each or $30 for a three-pack. Fitbit’s own Luxe bangle bracelet—which is well-made and sturdy while still looking delicate and feminine—retails for $90 in silver or $100 in gold or rose gold. A Luxe pendant on a lovely 17-inch chain is $80 in silver or $100 in gold, but automatic sleep tracking might not work as well if you wear the pendant overnight—it’s more suited for day-to-evening looks anyway. Fitbit’s new trackers can be found at Fitbit.com, and we’ll have full reviews of both the Charge 2 and the Flex 2 shortly.